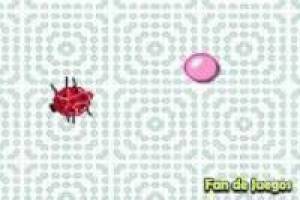 Handle this pink ball and dodge all the insects that you see around you using the ability to move with the mouse on the screen as if it were the game that is now fashionable, as is the Agario. How long can you survive without being eaten by bugs? As you dodge insects you will level up and your ball will grow, take yellow bubbles to decrease your size and survive longer. This fun game can be made from any device: Smartphone, tablet and PC. Dare and click on this game,. Enjoy the game Bugs are coming, it's free, it's one of our vermin games we've selected.